A three-view drawing of a ½-pood edinorog (1780 model) taken from A. S. Katasanov’s Album (1801). The heavily built gun carriage gives evidence of one of the edinorog’s primary characteristics – and draw-backs – its fearsome recoil. A ½-pood edinorog would have had a 6.1 in bore and would have fired either a 29 lb (Russian trade pound) solid ball very roughly equivalent to a British 24pdr, or a 22 lb (19.8 pounds British) explosive shell at a greater range and with greater accuracy than its British equivalent, which of course, could not fire explosive ammunition. Edinorogs were unique to the Russian army and navy. Aboard ship, they were generally mounted two per gun deck, alongside their nearest conventional cannon equivalents – ½-pood guns alongside Russian 24pdrs and one pood guns alongside 36pdrs. Russian naval artillery differed from French and British ordnance in one important respect, the early development and use aboard ships of small numbers of long-barrelled howitzers firing both explosive and solid shot. Edinorog translates into English as ‘unicorn’ and into French as ‘licorne’. English-speaking readers may be more familiar with the term ‘licorne’ but we are retaining the Russian usage here because it became the official designation within Russia. Edinorogs were developed by Field Marshal Shulavo, Chief of Ordnance, and introduced into the Russian army in 1757 and the Russian navy in 1767. They came to be called ‘unicorns’ because these mythical animals were displayed on his family coat of arms and stamped or cast on all Russian edinorogs thereafter. To our knowledge, edinorogs were limited in their use to the Russian army and navy save only for a brief period in the nineteenth century when they were also manufactured for the Austrian army. Edinorogs had conical gun chambers and, as a result, were easy to load and could maintain a rate of fire of three to four rounds per minute with a range of 2–2½ miles with a high degree of accuracy for the period. More flexible than standard artillery, they could fire solid shot, grapeshot, bombs or carcasses. Edinorogs began to equip Russian warships in very limited numbers from 1769 on. Their use against both the Turks and Swedes in the wars of the 1770s, 1780s and 1790s produced useful, if debatable, results as well as howls of protest from the Swedes after Gogland, who charged that their opponents were violating the laws of civilized warfare with these barbaric and un-Christian weapons. A source of continuing controversy, they were regarded by their opponents as being of limited value, doubtful reliability, and equally dangerous to friend and foe in battle. Edinorogs were generally mounted on line of battle ships only during time of war, with one or two pairs mounted on each gun deck replacing long guns of approximately equal calibre. Contrary to what one might expect, these guns were not mounted at either the bow or the stern. Instead they were placed amidships. Their use was formally discontinued for a time with the Gun Establishment of 1805, but they were reintroduced in 1826 under Nicholas I and continued in service through the end of sail in 1860. Most edinorogs fired hollow-core explosive ordnance as well as heavier solid ordnance. The guns were rated in terms of ‘poods’ rather than pounds and their effectiveness in combat is difficult to compare with more traditional long guns. A Russian ‘pood’ was a traditional commercial measure of weight consisting of 40 Russian ‘trade pounds’. 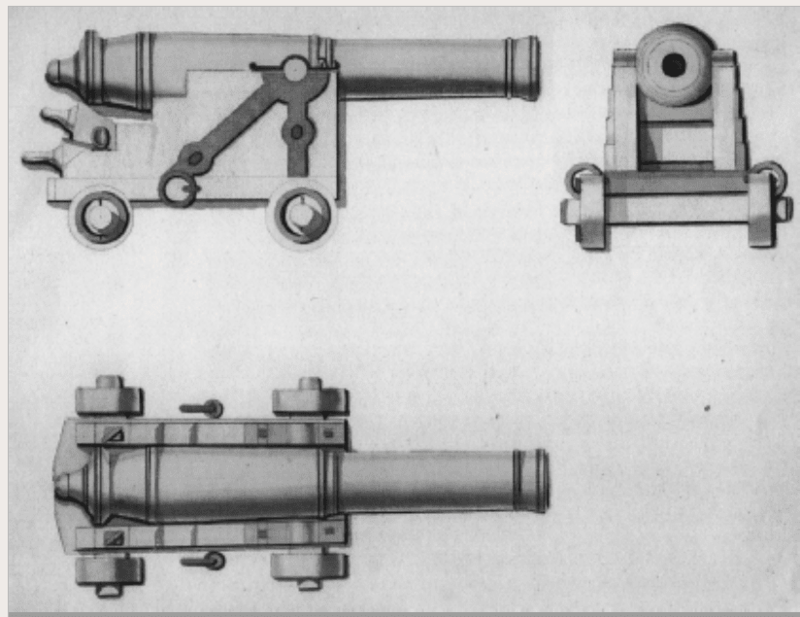 The earliest 1767 model 1-pood guns had a barrel diameter of 7.2 inches and actually fired a 40-pound explosive (bomb) shell, or a 48-pound solid shot, although the early models were too fragile to handle the solid ordnance reliably. These guns were fragile in service and had fearsome recoils. The improved version, introduced in 1780, moved up to 7.7 inches diameter and fired a 44-pound bomb shell and a much heavier 63-pound solid shot. To confuse matters for the uninitiated, these larger guns continued to be designated as ‘1-pood guns’. To confuse matters still further, the Russian ‘trade pound’ was the traditional pound in use in Russia and weighed 409.5 grams metric and not the ‘artillery pound’ of 490 grams introduced by Peter I, and in use for both army and navy guns. This was almost precisely equivalent to the French ‘pound’ of 489.5 grams, but the similarity was entirely fortuitous. To complicate matters still further, edinorogs were not described in terms of the weight of solid ordnance fired by the gun as was the case with standard naval artillery, but by the much lighter weight of the hollow-core explosive ordnance. This made sense when the weapon was introduced as the raison d’être for the new weapon was the incendiary ordnance and not the solid shot which was of secondary importance. Using poods in place of pounds also made sense because the charges fired by the first weapons fitted neatly into 40 (trade) pound packages. The improved 1-pood guns introduced in 1780 fired hollow shells weighing 44 trade pounds, which converts into 39.6 English pounds or 36.77 artillery pounds; while 1-pood solid shot weighed 63 trade pounds, which converts into 56.7 English pounds and 52.5 artillery pounds. Russian students are quite familiar with this duality, and are frequently given to using one or both measures without clearly indicating which system is in use. Unless otherwise indicated, all references to edinorogs will be made in terms of trade pounds. Edinorogs were eventually developed in a wide variety of weights, from ¼ pood to 1 pood, with even larger guns being used ashore. Edinorog bombs were spherical hollow devices and should not be confused with more advanced ordnance firing explosive cylindrical shells of the type developed in the 1820s in France.